I'm a self-confessed lover of muesli bars- it's the most convenient snack and perfect for that healthy boost of energy. Last week I had that craving for a good ol' bar- but not just any bar, a bar that would be jam-packed with as much nutrients as possible and of course, so delicious too! 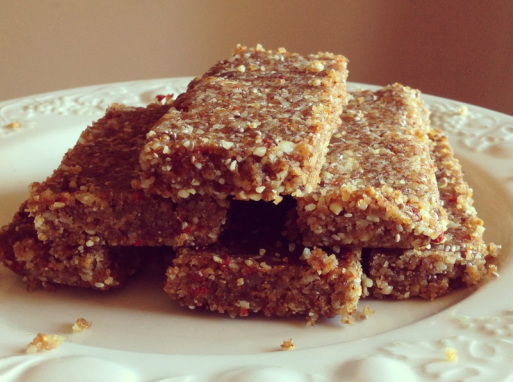 And so here it is... a healthy, sweet and definitely tasty snack that is so easy to make! 1. Combine all ingredients in a food processer and blend ingredients until everything is well combined- if the texture it too crumbly, just add a tablespoon of water. 2. Place mixture in a square container and smooth out mixture as much as possible. 3. Place in fridge for at least an hour and once it is ready, cut into rectangular pieces. Enjoy!